Mr. Rob and I were chatting about an upcoming Halloween party aaaaand SURPRISE, I said I’d go. I don’t know why, but I just wasn’t feeling the Minnie Mouse costume, as cute as it is, for this particular get together so I wanted to do something different. But I didn’t want to spend pretty much any money at all on it. Oh, and I had a night to get it together, too. I dug out my pink rain boots and I busted out my summer time overalls (that might be a bit tighter than I had anticipated at the beginning of this concept coming together, darn Halloween candy!!!) and even pulled out the pink flannel. 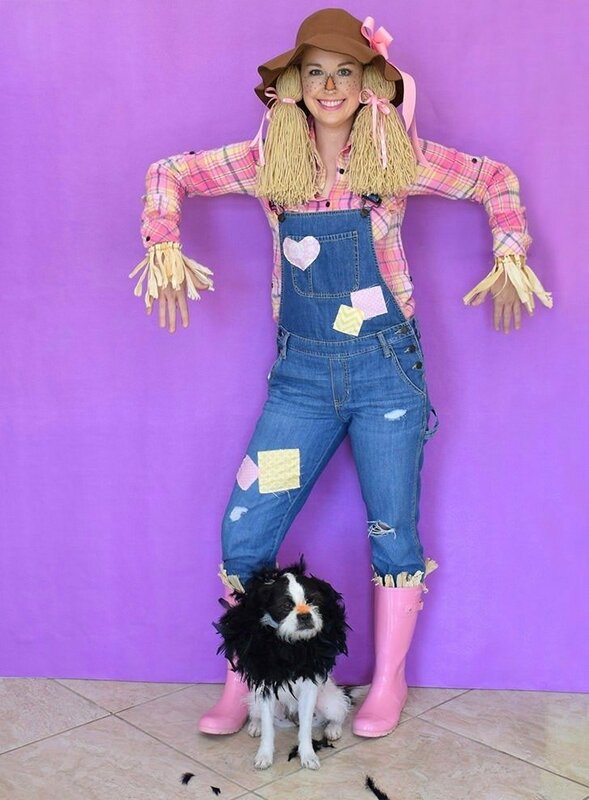 Then I put the pups on their leashes asked I Rob to take me up to Walmart so I could grab a few things so I could easily turn this outfit into the cutest ever DIY scarecrow costume. At the store, I totally kept it on budget and I got a few crafty items for $8. Yeah, you read that right, this costume cost me only EIGHT BUCKS! Back home knocked everything you see in my costume clean out within the first 2 episodes of the new season of Stranger Things. Boom! Cheap, fast, fabulous. And I have to tell you I really love this costume. It’s so much fun and it’s so cute and most importantly, it’s PINK because that’s what I have in my closet! 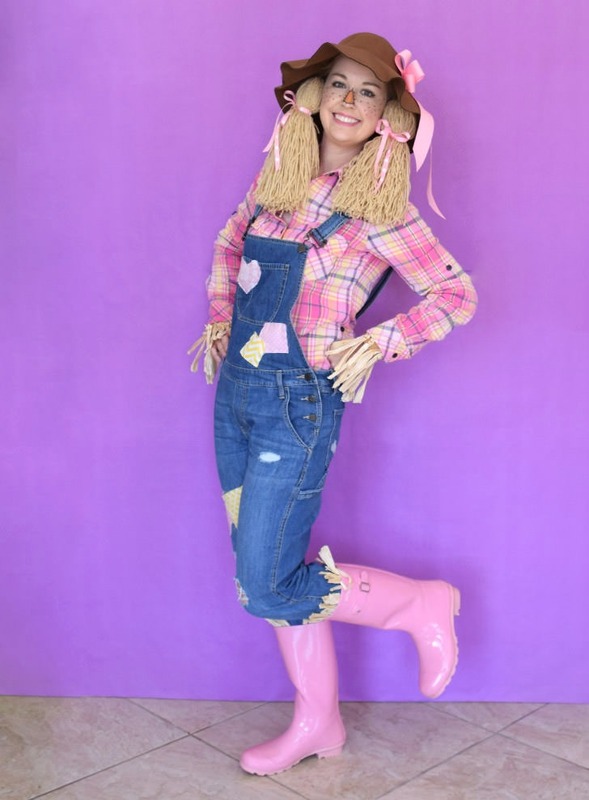 First up let’s talk about the overalls because they’re pretty important for a scarecrow costume… these are my summer pair that I love from the Gap. Like most of my summer denim they are high water cut (I don’t know what you call that) which isn’t super fall friendly BUT a pair of boots will easily cover that business up and no one will be the wiser. Because I am going to wear these suckers again next summer I didn’t want to ruin them so any modifications had to be temporary only and I’m sure you don’t want to ruin a good pair of overalls either. I mean, the perfect pair can be hard to find, right? To get an old, worn out look we’re going to add patches. 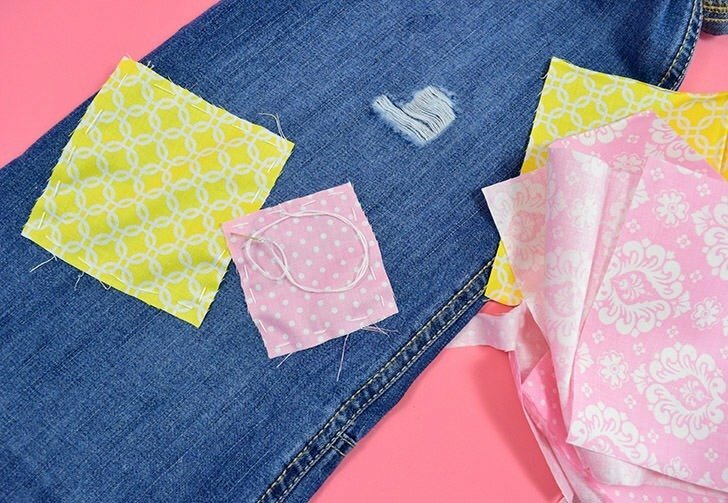 Take scrap fabric and cut squares out of it and loosely baste it onto the legs and bib of your ‘alls. I didn’t even bother to trim up the thread after I got a patch on, it’s just dangling inside of the overalls. 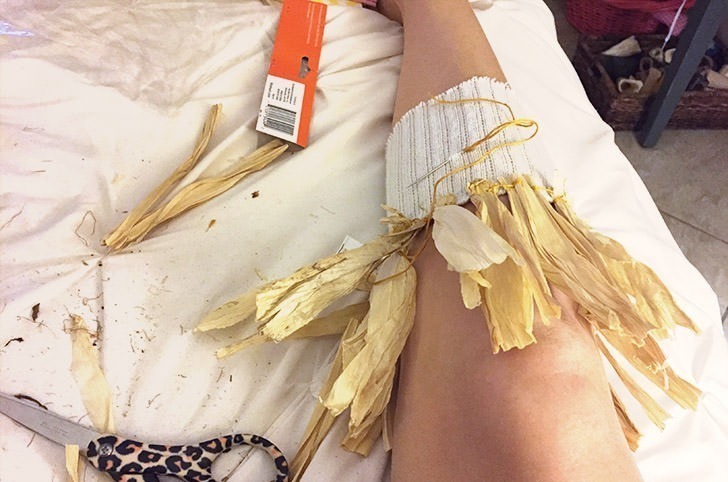 In the fall section at the store I found these corn husk flowers, $1 for a package of 4. 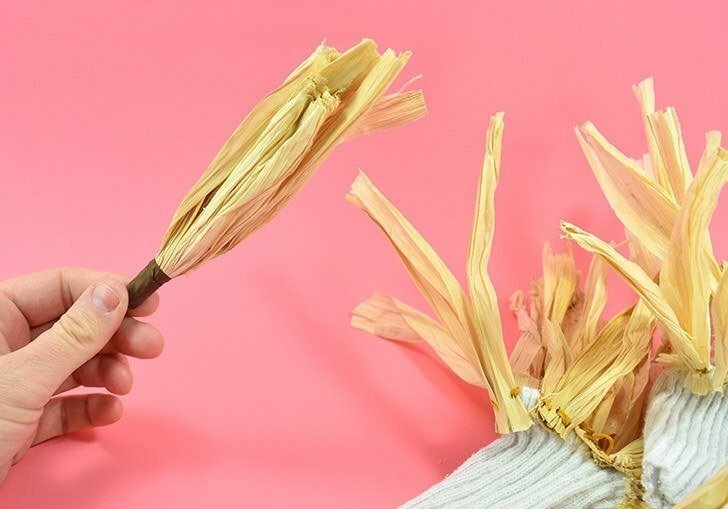 You can also buy straight corn husks, grab a handful of hay from somewhere or even cut strips out of wheat colored, beige or yellow craft felt. We’re going to add these to gloves and socks for a little bit of that stuffing peeking out business that we don’t actually have to worry about losing. 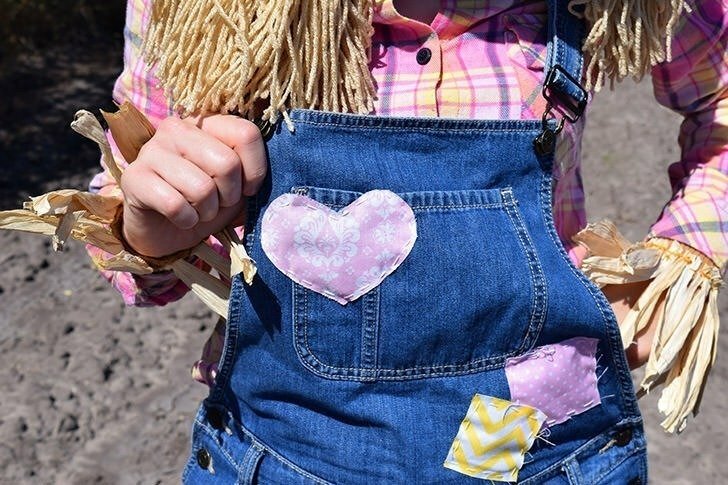 Because if you’ve ever stuffed the top of your overalls with hay and thinking you were going to hang on to that stuff through the evening, I can tell you for a FACT you’d be wrong and your party host just might be a little bit irked with your unintended litter. 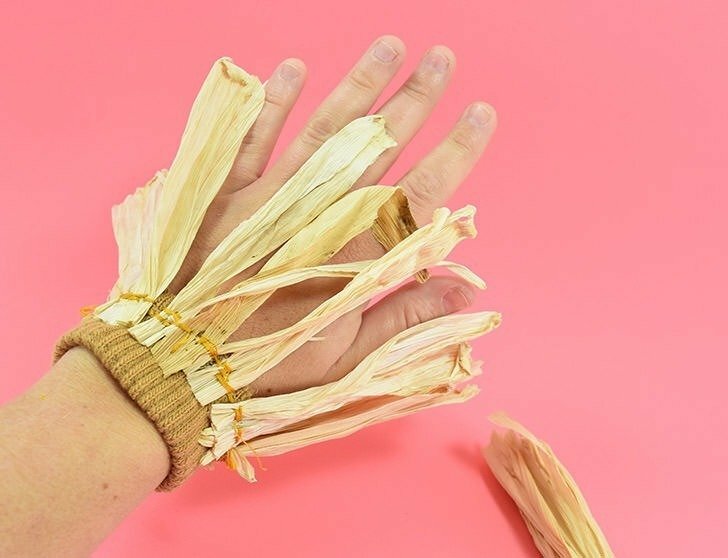 For the gloves hack of the hand bit so you only have the wrist band and then using embroidery floss tack your husks/hay/felt around so that it will stick out of your shirt covering your hands. If you can snag a pair of socks from somebody bigger than you, definitely do that. I had Rob dig through his drawer and give me two of his unmated socks and that worked out well for us. Cut the socks from the tops to about 4-6 inches tall and then pull onto the area of your calf where they’ll need to sit to peek out over your boots. 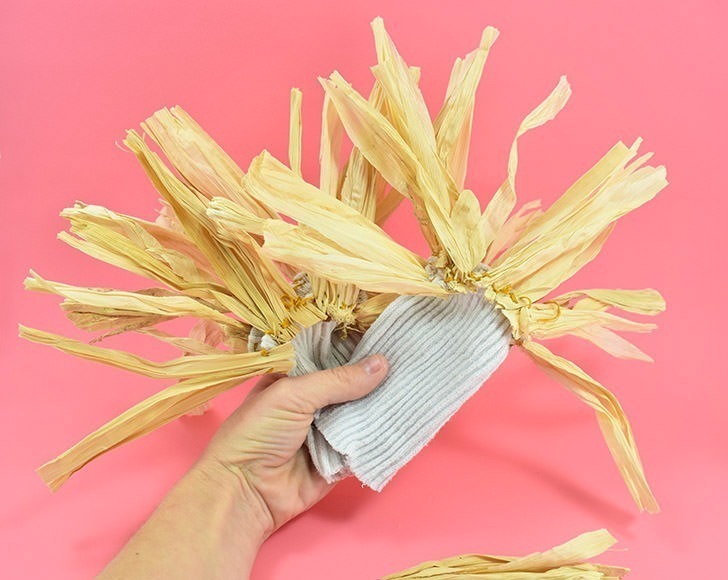 Carefully stitch your husks/hay/felt onto the socks while worn so that you have the right amount of stretch still in that thing that you can pull it up over your legs and your overalls when it’s time to suit up. 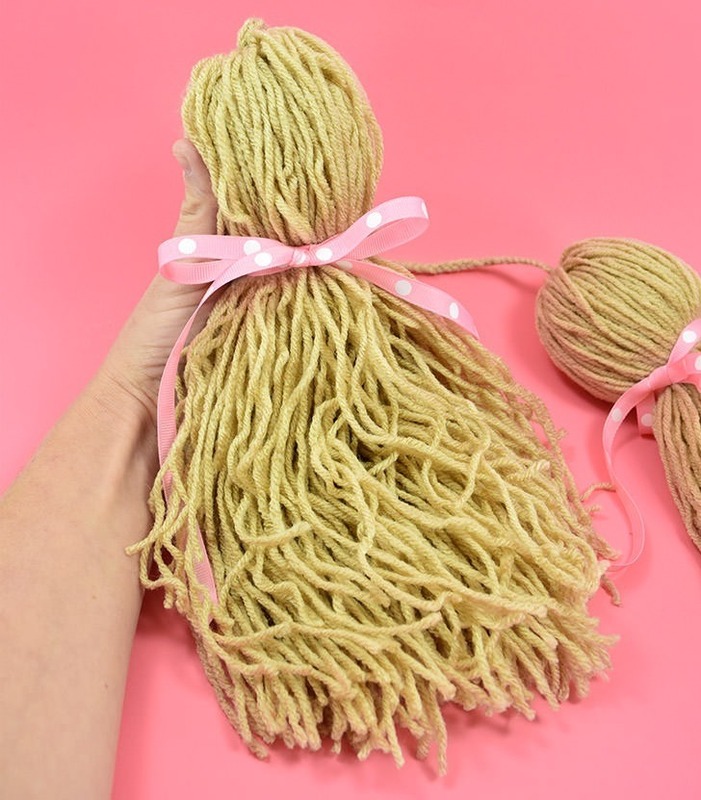 You can also easily make some super cute bunches with most of a skein of yarn. 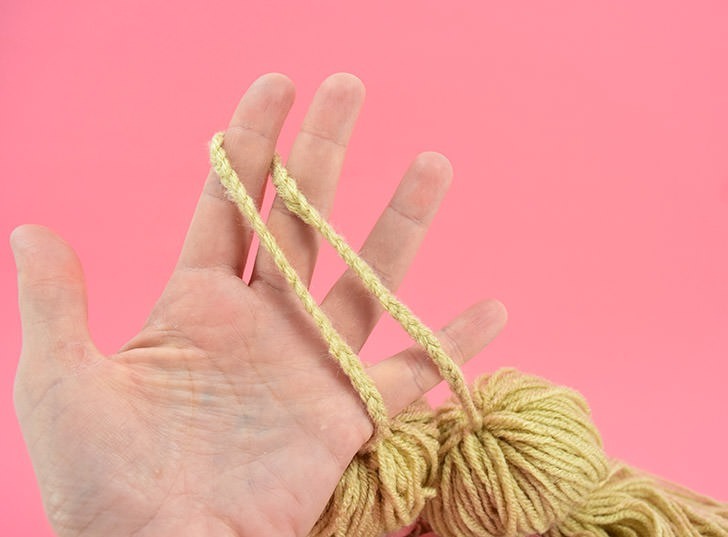 Now I did this in bed, again, but didn’t take any crappy cell phone pics so we’re going to have to use our words here… Take the yarn and wind it over your hand to your elbow over and over, like you’re winding up an extension cord. When it starts to get uncomfortable, cut the yarn in half and lay out flat. Continue until you only have 10 or so yards of yarn left. Divide the pile of yarn out into 2 bunches. 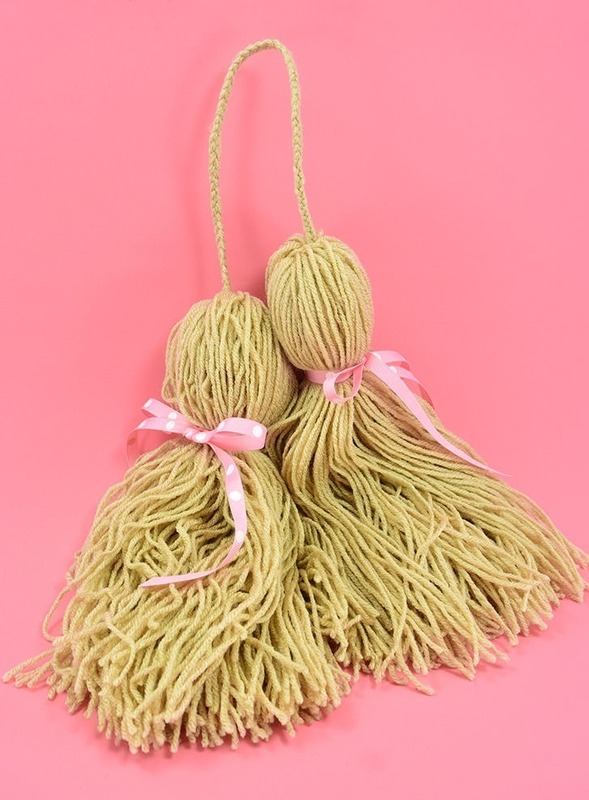 Take 2 strands, about 6 inches long, from your skein yarn and tie both of the piles right in the middle to make the bunches. If you have some thin ribbon, a few inches down you can also add pretty bows on each of your ponytails for a little extra flair. 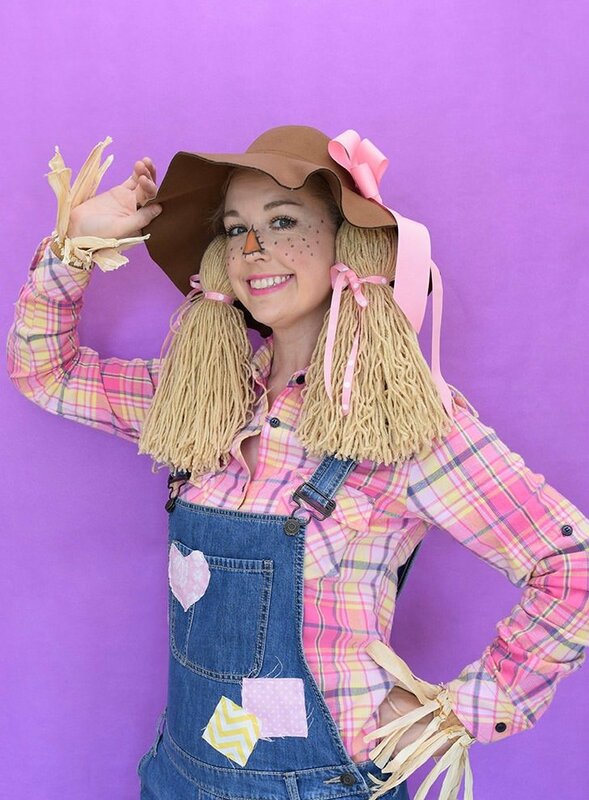 The way this thing is going to work is you’re going to place the braid on top of your head, under your floppy hat and pin it down with bobby pins to stay put. 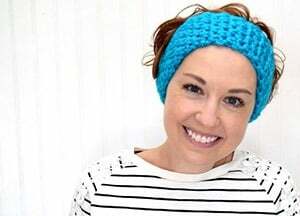 Keeping that in mind, try the “wig” thing on and figure out where you need to tie off your braid on the other ponytail so that it rests beneath your other ear. 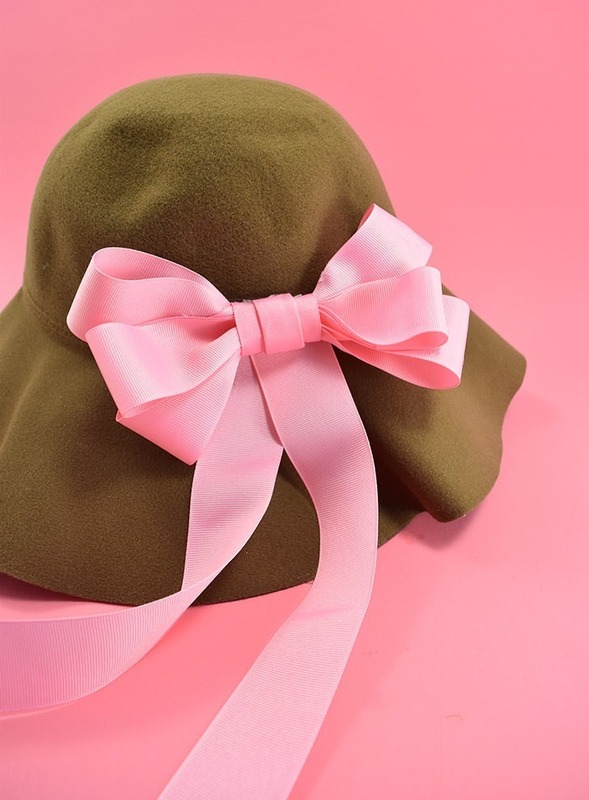 Speaking of floppy hats, if you’re super matchy-matchy like me you can also take some wide ribbon and make a big, floppy bow with hot glue. If you don’t want to damage your hat (mine is a nice felt hat I don’t want to mess up) you can try using double-sided tape to adhere it, or you can always use a brooch pin, if that doesn’t give you enough hold. On felt, though, it should be perfectly sticky enough. 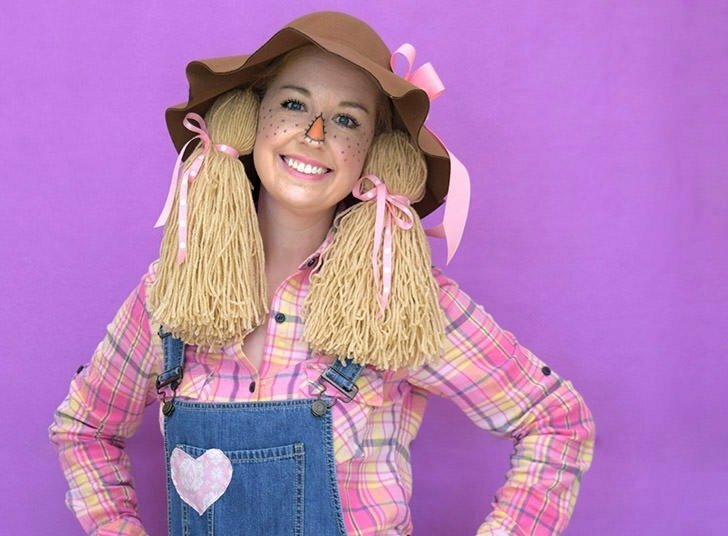 Rob and I looked up a bunch of different scarecrow makeup ideas because we weren’t too sure how to accomplish that. Heck, I can barely put on regular ol’ makeup. 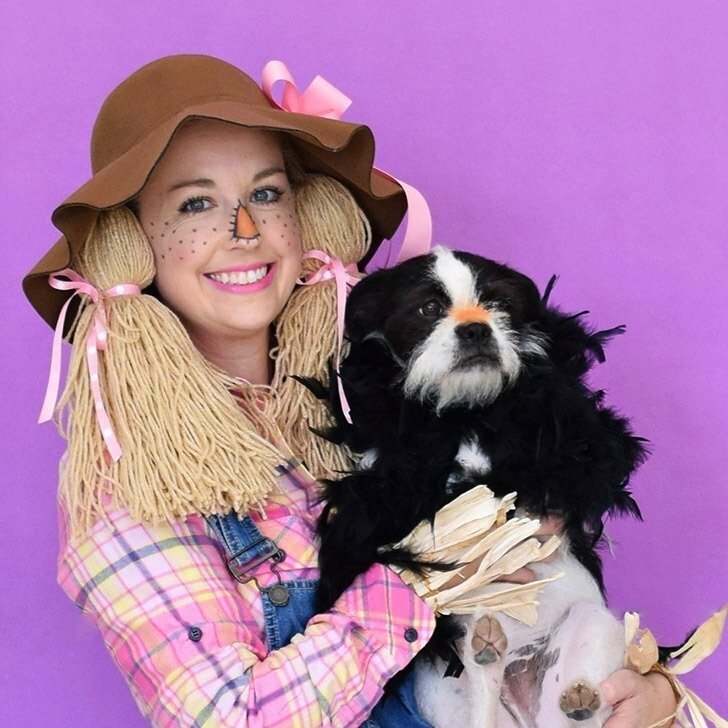 We found some super neat scarecrow makeup looks on Pinterest alone but I have a tendency to rub my face, and stitches or big hanging down eyelashes on my cheeks or anything crazy was going to very likely be smudged pretty quickly. So I decided to do my makeup as usual but I also swiped some mascara on my bottom lashes, something I only really do when I get dressed up and some really bright pink lipstick that was accidentally sent to me but it turns out I love. I also went with 2 coats on the mascara so my eyelashes would stand out more strongly since I wasn’t going to draw big lashes on. 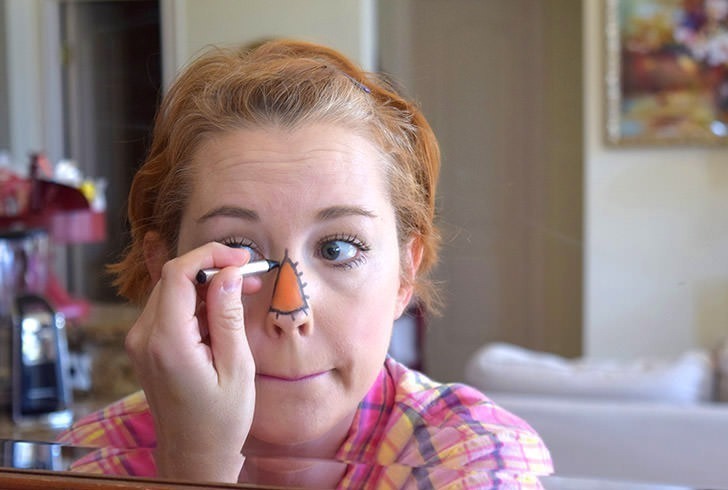 Then Rob drew a triangle shape on my nose and filled it in with orange and I added stitches around the sides. Seriously, that business was itchy. 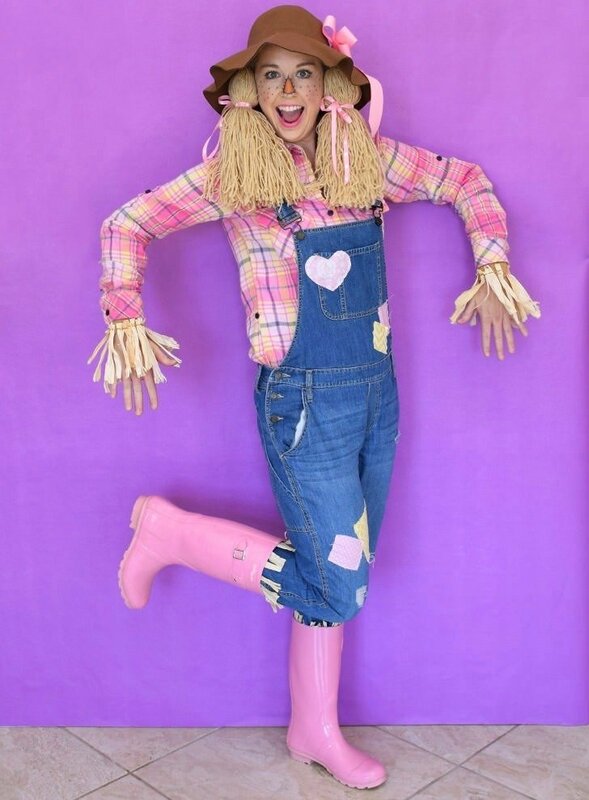 Hey, I’m a scarecrow and it was cheap, fast enough that it wasn’t a total freak out even being the night before last minute and it turned out cute, right?!? And since no scarecrow is complete without a crow Rob ran into town (because he’s pretty much the greatest and I was embarrassed to go to the store in my costume makeup) and grabbed a black feather boa from Michael’s. With a little bit of orange paint on her nose, too, she had a beak with and her feathers wrapped around her collar, she was the cutest little crow. Who could shoo that cutie away? Nobody, that’s who!